An abduction by the military. Abductees are frequently re-abducted and examined by the miliutary to gain information about our alien visitors. This is an important area that is seldom discussed. There is plenty of evidence that many abductions are in fact generated and conducted by covert U.S. military forces. This is a hard fact to deal with but no discussion of abductions would be complete wihout it. CSETI (Center for the Study of Extraterrestrial Intelligence) founded by Dr. Steven Greer has uncovered over 150 eyewitnesses from defense contractors, NASA, the U.S. military, Central Intelligence Agency and other covert intelligence organizations that confirm the existence of extraterrestrial beings. Several of these witnesses confirm U.S. covert intelligence involvement with human abductions. Run, don't walk, to the CSETI website at www.cseti.org where you will find photos of some of these witnesses and their statements confirming knowledge of ETs. Greer's sources have stated that these covert agencies have the ability to create a "holographic" abduction so real that a person would easily pass a lie detector test. 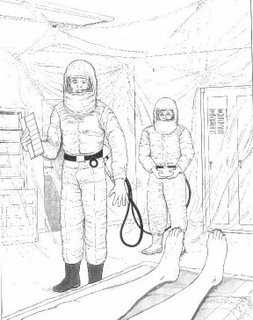 Abductee and eyewitness Pamela Hamilton has experienced such abductions and in a clear, unaltered state was taken by a group composed of both alien-looking being accompanied by U.S. military personnel in uniform. Yeah, I know, this is hard to accept, but all indications are it's true. There are just too many witnesses to ignore, both as victims and people with knowledge of these activities from the inside. It's a big issue, folks, but you're gonna have to deal with it sooner or later. These covert organizations have the ability to impose a holographic experience on a person or group of people, even at a distance! This is real, not science fiction. "The hardest part of the abduction experience to deal with is the feeling that you must be going crazy. I cope with it because I insist on living a normal life." Melinda works with others besides herself who are drugged, kidnapped, interrogated, and harassed by the U.S. military in an effort to find out what abductees know about the aliens. Members of the military also kidnap abductees in efforts to recover implants that aliens have placed in them. Another abductee, Debbie Jordan-Kauble, also speaks of her traumatic experience in which she and companions have been drugged and kidnapped by members of the military. Debbie's lifelong experiences with abductions is told in her book, Abducted: The Story of The Intruders Continues. Debbie is also the subject of Budd Hopkins' book, Intruders, and the television mini-series of the same name. Debbie has appeared on "Oprah Winfrey," "Sightings," and "Maury Povich." She can be reached at her website: http://www.debshome.com. Melinda's body of evidence is large and impressive. It includes photos, medical lab tests, eyewitnesses accounts, and a growing number of people with the same testimony. Among them is Kim Carlsberg, whose story is recounted in "Beyond My Wildest Dreams". If you have had similar experiences you can contact Melinda directly at: Melinda Leslie, UFO Lectures of Orange County, (714) 760-0275; Fax: (714) 644-4329, e-mail: Melinda_Leslie@msn.com.